Can Overlap of Dermatome-Like Fields in the Maxillary Canine Region Explain Canine Transpositions and Canine Agenesis? Introduction: Questions concerning maxillary canine transposition and maxillary canine agenesis remain unexplained. These questions are raised in this original hypothesis. The Hypothesis: The hypotheses are that the maxillary canine can be located in a separate dermatome field and that this field can overlap neighboring fields just as overlap occurs in body dermatomes. It is also hypothesized that delay in innervation and maturation of dermatome-like canine field may be the etiology behind maxillary canine agenesis and combined canine agenesis and first premolar agenesis. Evaluation of the Hypothesis: It is demonstrated in this article how embryology, growth, and development combined with clinical examples makes it possible to suggest answers to these rare questions concerning transposition and agenesis of the maxillary canines. The answers might be the foundation of future studies for genotypic mapping. All though the answers to these hypotheses seem reasonable, they are difficult to prove. The etiology behind maxillary canine transpositions and canine agenesis in the permanent dentition remains unexplained. Q1: How and when is a permanent maxillary canine positioned between the premolars or between the incisors, and why does similar transpositions not occur in the primary dentitions? Q2: Why can agenesis of a permanent maxillary canine occur as a single finding in an otherwise normal developed dentition? The background for answering the questions lies in insight in transposition and agenesis of the permanent maxillary canine and further insight into development of primary and permanent maxillary canines and maxillary growth. Dental transposition is an ectopic eruption, resulting in an alteration of the normal tooth sequence in the dental arch. The frequency of transposition is approximately 0.3%, and the female/male ratio is 3:1 with a higher frequency in the maxilla compared with the mandible. Transposition of the maxillary canine and the premolar occurs more frequently than that of the maxillary canine and lateral incisor. Dental deviations associated with transposition have been described.,,,, Ely et al. have focused on a genetic origin of dental transpositions. In a recent study, Danielsen et al. described dental and skeletal findings in 63 individuals with unilateral and bilateral transpositions of the maxillary canines. This study demonstrated increased occurrence of agenesis, higher prevalence of taurodontic morphology, peg-shaped lateral incisors in dentitions with transposition. Skeletal maxillary retrognathia was associated with canine/premolar transposition, and posterior inclination of the maxilla was associated with canine/incisor transposition. Description of dentitions with transpositions in primary dentition was not found in the literature. Agenesis of permanent maxillary canines is a rare form of agenesis with a prevalence of 0.09% to 0.13% registered out of 48,274 individuals and a gender ratio female/male 2:1. In several studies, genotypic deviations were described in different patterns of tooth agenesis. Specific genotype for maxillary permanent canine agenesis was not found. A recent study described dental and craniofacial characteristics in 91 individuals with agenesis of permanent maxillary canines. In this study, there were two groups. One group had only agenesis of the permanent canines and did not show other dental deviations. The second group had several ageneses, including agenesis of the permanent maxillary canine. It had several teeth with abnormal morphologies, abnormal resorption pattern in the primary teeth, and significantly higher frequency of first premolar agenesis. Enlarged cranial base angles were found in both groups. Primary canine: The prenatal development of the early tooth bud starts at 7th week of gestation. The innervation of the cap stage followed by early hard tissue formation starts shortly after.,,, From the cap stage, a tooth bud for the permanent canine is formed from the dental lamina [Figure 1]. Permanent canine: The exact time for innervation of the permanent tooth bud is not known. Seemingly, all histological images of canine formation demonstrate formation of the primary canines. Access to permanent tooth buds for histological analysis after 20 weeks of gestation prenatally and also postnatally is not possible. It is well documented that the ectodermal dental lamina gives rise to the enamel secretion, whereas the neural crest ectomesenchymal cells give rise to the odontoblast, which secretes dentin. The hard tissue is presumed to start development of the permanent canines after innervation of the tooth primordium. When the permanent tooth formation starts, it is still located at the inferior aspect of the ocular cavity. In this location, the root formation starts, and the following eruption path is long compared with the primary canines. This difference in migration path might be coursed by the late maturity of the permanent canine and the vertical growth of the maxilla. As a conclusion, there are similarities between the two dentitions due to early prenatal onset of tooth formation. However, dissimilarities occur in tooth maturation and tooth eruption. Eruption of a permanent maxillary canine occurs approximately 10 years after eruption of a primary canine. The maxilla is derived from the ectomesenchyme. The early bone formation occurs close to the peripheral nerves. The elevation of the palatal shelves is correlated with the maturation of the craniofacial skeleton and with the movements of the tongue and the bilateral component of the mandible., The transverse palatine suture allows the maxilla to growth in sagittal–vertical direction. Already prenatally the growth pattern of the maxilla is established. Transversal growth occurs in midpalatal suture and sagittal growth in the transpalatal suture and by apposition posteriorly. Vertical growth occurs partly in the transpalatinal suture and partly by apposition on the palatal alveolar surfaces along with resorption on the floor in the nasal cavity. From the prenatal period to the perinatal period, the maxillary growth is massive and the growth continues until puberty when the permanent canines erupt. A study has suggested that craniofacial growth is under control by peripheral nerves. Dermatome-like fields in the maxilla: Maxillary fields with different origins from the neural crest have been described.,,, These fields are the bilateral frontonasal fields, the bilateral maxillary field, and bilateral palatal fields illustrated in [Figure 2]A. It is characteristic that each field, like dermatomes, has its specific innervation. The innervation to the jaws occurs by continuous outgrowth of nerve branches to different groups of teeth/jaws areas as formally demonstrated in the mandible. Figure 2: Human palate (schematic). Neuro-crest fields: yellow = bilateral frontonasal; red = bilateral maxillary; orange = bilateral palatine. (A) Right maxillary field marked with neuro-crest sign. (B) Right maxillary field subgrouped in canine (bluish) and premolar fields. (C) Transposition of canine field (bluish) to area between premolars. Canine and premolar fields overlap. (D) Transposition of canine field (bluish) to region between the incisors. Canine and incisor fields overlap. (E) “Underdevelopment” of canine field and agenesis of canine. (F) “Underdevelopment” of canine field and agenesis of canine and the first premolar. Clinical studies have documented that virus attacks on the peripheral nerves to the jaws have coursed regional arrest of tooth formations, tooth eruptions,, and root resorption. From dermatome fields in the body axis, it is well described that fields are often overlapping at the borders. This explains the band-like appearing herpes zoster virus attacks on the peripheral nerves within body dermatomes. Ans. 1: It is hypothesized that the maxillary palatine field covering the canine premolar region can be subgrouped in a separate maxillary canine field and the remaining premolar field [[Figure 2]B]. This subdivision appears logical from the early pattern of alveolar bone formation as demonstrated. In this study, it was demonstrated that the incisors in the early stages shared a common alveolus. This was also the situation for the primary molars, which also shared a common alveolus. However, the primary canines were located in a separate alveolus without a bony labial wall. As it is well known that the dermatomes in the body axis can overlap each other, it seems logical to suggest that also the isolated maxillary canine field can overlap the premolar field during growth and thereby transport the permanent canine anlage to a transpositional site between the premolars [[Figure 2]C]. It is also possible that the canine field can overlap the premaxillary field and thereby transport the permanent anlage to a transpositional site between the incisors [[Figure 2]D]. Innervation seems to be important for these transpositions. In the primary dentition, innervation of the canine tooth bud occurs instantaneously before bone growth, and therefore, transpositional migration of tooth buds seems impossible. Ans. 2: It is hypothesized that maxillary canine dermatome-like field is “underdeveloped.” The reason for this could be a spatiotemporal delay in innervation of the field. In this case, the canine agenesis is the only dental deviation in the dentition [[Figure 2]E]. A more severe delay in innervation or field maturation is demonstrated schematically in [Figure 2]F. This figure demonstrates the possible etiology behind the significant finding of canine agenesis associated with first premolar agenesis. Two questions concerning rare dental deviation in the maxilla are raised. It is demonstrated how embryology, growth, and development combined with clinical examples make it possible to suggest answers to these rare questions. The answers might be the foundation of future studies for genotypic mapping. The hypotheses are that the maxillary canine can be located in a separate dermatome field and that this field can overlap neighboring fields just as overlap in body dermatomes. It is also hypothesized that delay in innervation and maturation of dermatome-like canine field maybe the etiology behind maxillary canine agenesis and behind combined canine agenesis and first premolar agenesis. Although these hypotheses seem reasonable, they are difficult to prove. The corresponding author has editorial involvement with Dental Hypotheses. 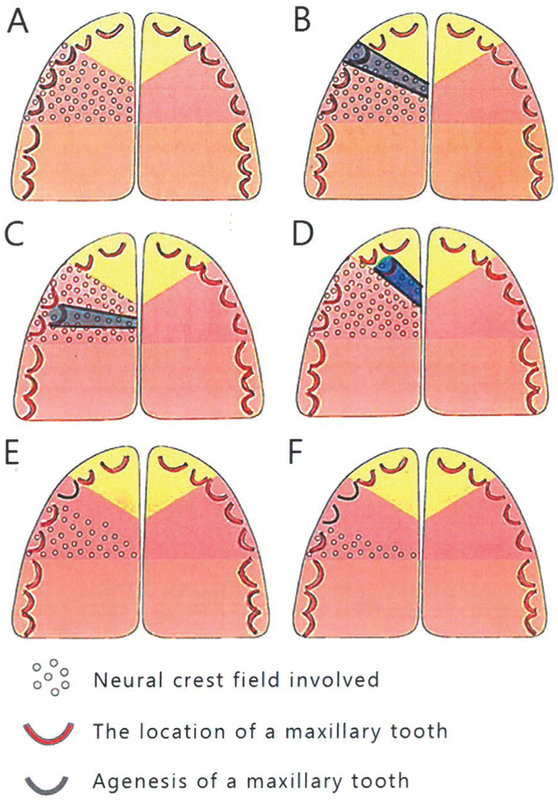 Peck S, Peck L. Classification of maxillary tooth transpositions. Am J Orthod Dentofacial Orthop 1995;107:505–17. Peck S, Peck L, Kataja M. Mandibular lateral incisor-canine transposition, concomitant dental anomalies, and genetic control. Angle Orthod 1998;68:455–66. Plunkett DJ, Dysart PS, Kardos TB, Herbison GP. A study of transposed canines in a sample of orthodontic patients. Br J Orthod 1998;25:203–8. Shapira Y, Kuftinec MM. Maxillary tooth transpositions: Characteristic features and accompanying dental anomalies. Am J Orthod Dentofacial Orthop 2001;119:127–34. Papadopoulos MA, Chatzoudi M, Kaklamanos EG. Prevalence of tooth transposition. A meta-analysis. Angle Orthod 2010;80:275–85. Celikoglu M, Miloglu O, Oztek O. Investigation of tooth transposition in a non-syndromic Turkish anatolian population: Characteristic features and associated dental anomalies. Med Oral Patol Oral Cir Bucal 2010;15:e716–20. Ely NJ, Sherriff M, Cobourne MT. Dental transposition as a disorder of genetic origin. Eur J Orthod 2006;28:145–51. Danielsen JC, Karimian K, Ciarlantini R, Melsen B, Kjær I. Unilateral and bilateral dental transpositions in the maxilla-dental and skeletal findings in 63 individuals. Eur Arch Paediatr Dent 2015;16:467–76. Polder BJ, Van’t Hof MA, Van der Linden FP, Kuijpers-Jagtman A. A meta-analysis of the prevalence of dental agenesis of permanent teeth. Community Dent Oral Epidemiol 2004;32:217–26. Stockton DW, Das P, Goldenberg M, D’Souza RN, Patel PI. Mutation of PAX9 is associated with oligodontia. Nat Genet 2000;24:18–9. Kjaer I, Kocsis G, Nodal M, Christensen LR. Aetiological aspects of mandibular tooth agenesis—Focusing on the role of nerve, oral mucosa, and supporting tissues. Eur J Orthod 1994;16:371–5. Kjaer I. Etiology-based dental and craniofacial diagnostics. Oxford, UK: Wiley Blackwell; 2017. Arvedsen KP, Kjaer I. Dental and craniofacial findings in 91 patients with agenesis of permanent maxillary canines. Eur Arch Paediatr Dent 2017;18:243–50. Christensen LR, Janas MS, Møllgård K, Kjaer I. An immunocytochemical study of the innervation of developing human fetal teeth using protein gene product 9.5 (PGP 9.5). Arch Oral Biol 1993;38:1113–20. 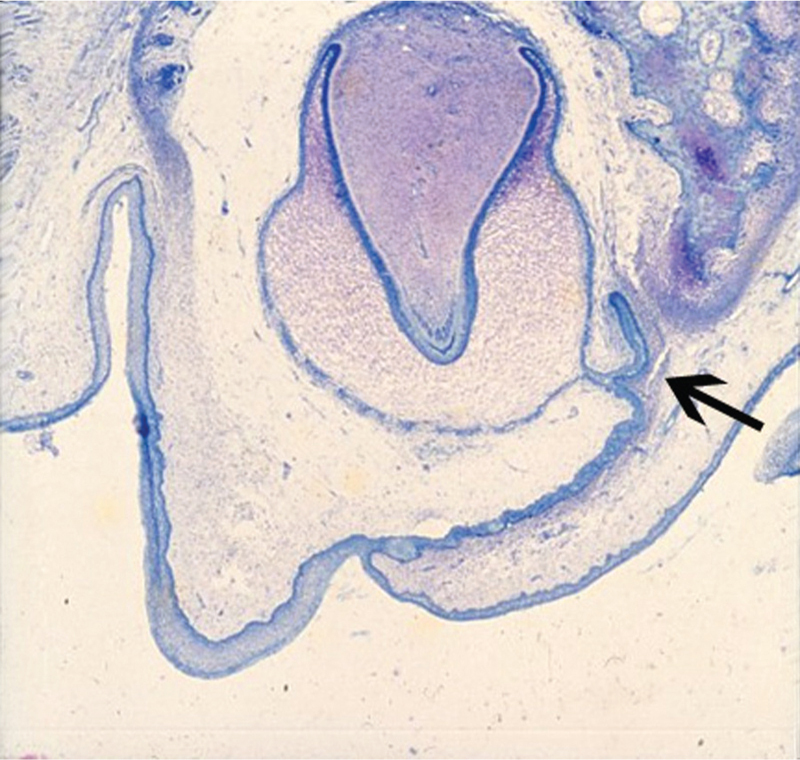 Christensen LR, Møllgård K, Kjaer I, Janas MS. Immunocytochemical demonstration of nerve growth factor receptor (NGF-R) in developing human fetal teeth. Anat Embryol (Berl) 1993;188:247–55. Kjaer I. Neuro-osteology. Crit Rev Oral Biol Med 1998;9:224–44. Kjaer I. Correlated appearance of ossification and nerve tissue in human fetal jaws. J Craniofac Genet Dev Biol 1990;10:329–36. Kjaer I. Human prenatal palatal shelf elevation related to craniofacial skeletal maturation. Eur J Orthod 1992;14:26–30. Kjaer I, Bach-Petersen S, Graem N, Kjaer T. Changes in human palatine bone location and tongue position during prenatal palatal closure. J Craniofac Genet Dev Biol 1993;13:18–23. Kjaer I, Keeling J, Russell B, Daugaard-Jensen J, Fischer Hansen B. Palate structure in human holoprosencephaly correlates with the facial malformation and demonstrates a new palatal developmental field. Am J Med Genet 1997;73:387–92. Njio BJ, Kjaer I. The development and morphology of the incisive fissure and the transverse palatine suture in the human fetal palate. J Craniofac Genet Dev Biol 1993;13:24–34. Parner ET, Heidmann JM, Kjaer I, Vaeth M, Poulsen S. Biological interpretation of the correlation of emergence times of permanent teeth. J Dent Res 2002;81:451–4. Kjaer I, Nolting D. Immunohistochemical PGP 9.5 positivity in human osteoblasts may indicate that compensatory and dysplastic craniofacial growth are under control by peripheral nerves. Orthod Craniofac Res 2008;11:196–200. Kjaer I. Orthodontics and foetal pathology: A personal view on craniofacial patterning. Eur J Orthod 2010;32:140–7. Kjaer I. New diagnostics of the dentition on panoramic radiographs—Focusing on the peripheral nervous system as an important aetiological factor behind dental anomalies. Orthod Waves 2012;71:1–16. Kjaer I. Dental approach to craniofacial syndromes: How can developmental fields show us a new way to understand pathogenesis? Int J Dent 2012;2012:14574. Chávez-Lomeli ME, Mansilla Lory J, Pompa JA, Kjaer I. The human mandibular canal arises from three separate canals innervating different tooth groups. J Dent Res 1996;75:1540–4. Bang E, Kjaer I, Christensen LR. Etiologic aspects and orthodontic treatment of unilateral localized arrested tooth-development combined with hearing loss. Am J Orthod Dentofacial Orthop 1995;108:154–61. Becktor KB, Reibel J, Vedel B, Kjaer I. Segmental odontomaxillary dysplasia: Clinical, radiological and histological aspects of four cases. Oral Dis 2002;8:106–10. Kjaer I, Strom C, Worsaae N. Regional aggressive root resorption caused by neuronal virus infection. Case Rep Dent 2012;2012:693240. Schoenwolf GC, editor. Larsen’s human embryology. 4th ed. Churchill Livingstone; Elsevier 2009. Kjaer I, Bagheri A. Prenatal development of the alveolar bone of human deciduous incisors and canines. J Dent Res 1999;78:667–72.